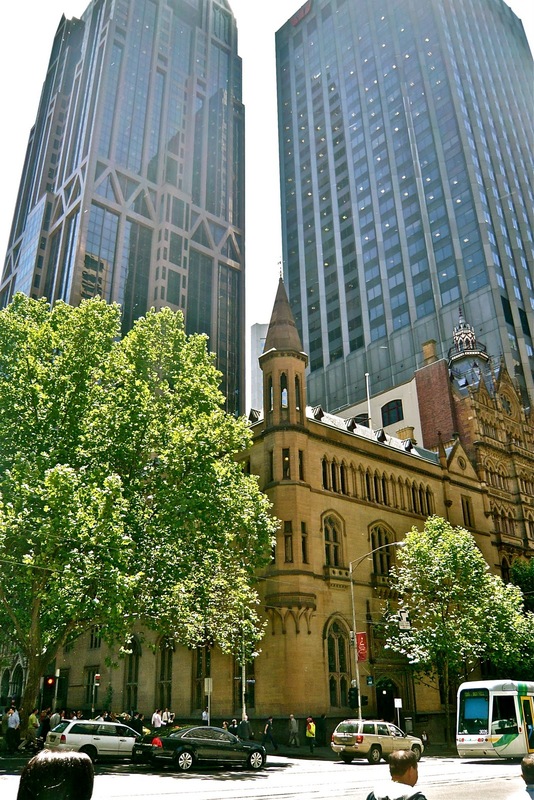 The ANZ Gothic Bank stands majestically on the corner of Queen Street and Collins Street. 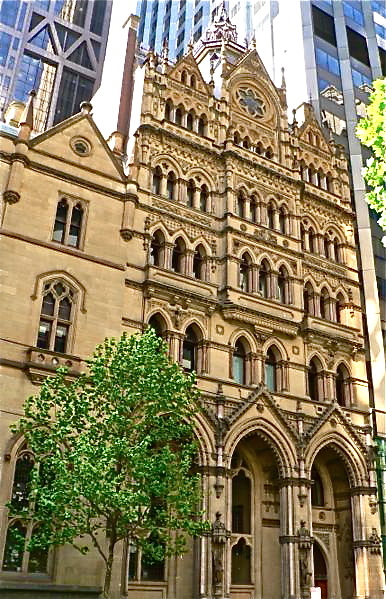 It comprises two buildings: the former English, Scottish and Australian (ES&A) Bank on the corner and the former Melbourne Stock Exchange, fronting Collins Street. 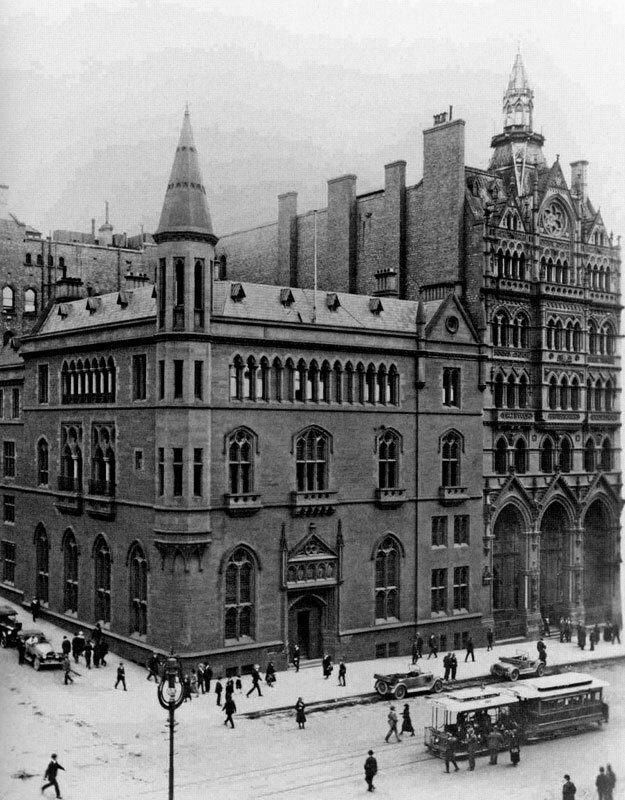 In 1923 the two buildings were renovated and combined, becoming known simply as the 'Gothic Bank.' Both are superb examples of the gothic revival style, albeit in contrasting ways. 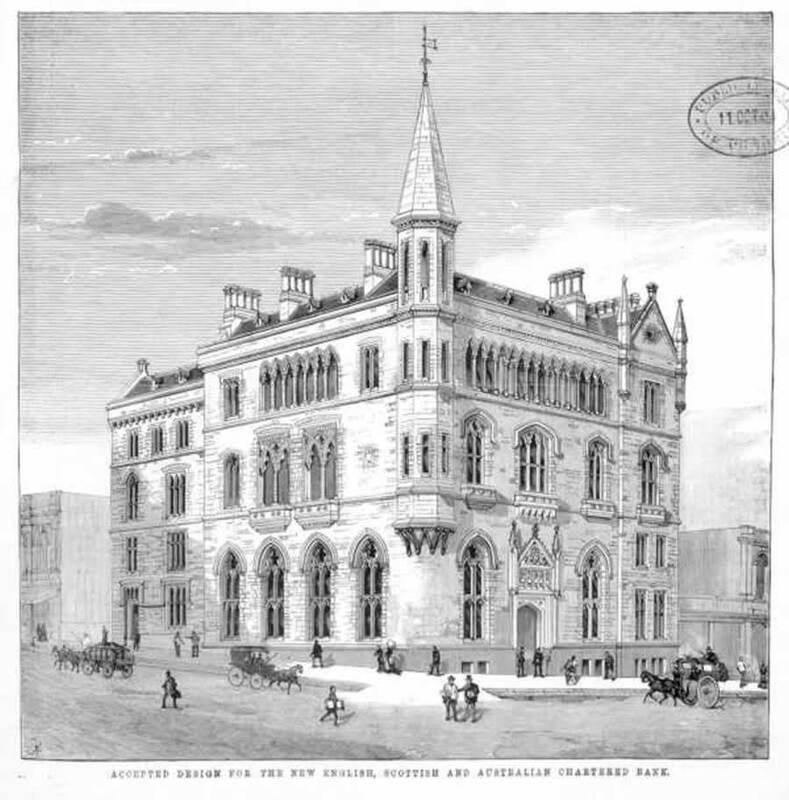 The former ES&A Bank is an exercise in graceful restraint, whereas the former Stock Exchange reflects the exuberance of the 1880s’ banking boom. 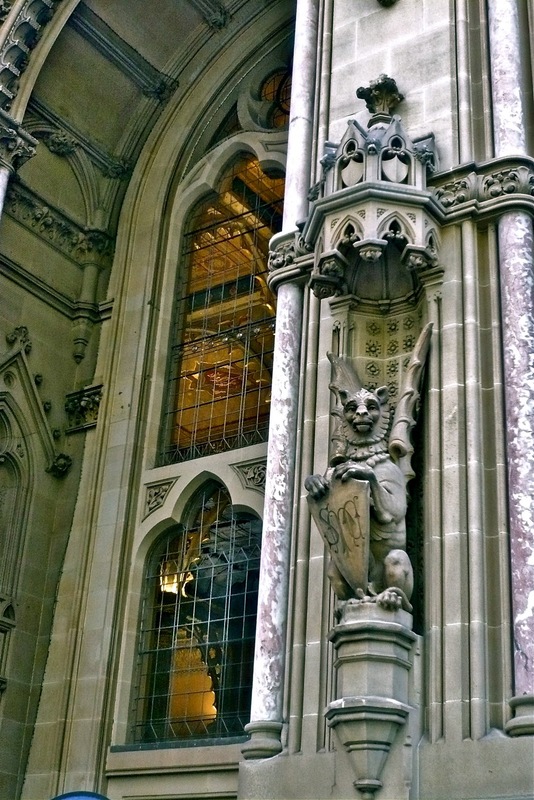 In recent times, they were restored as part of the construction of the ANZ World Headquarters. 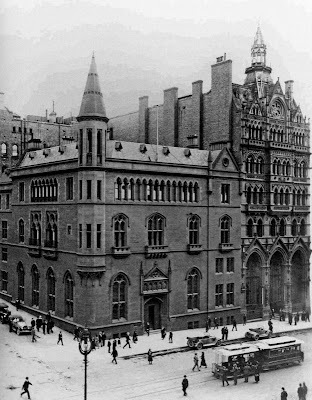 Built in 1883-87, the former ES&A Bank was designed by architect William Wardell in the gothic revival style. The lancet windows, lofty ceilings and narrow spire emphasise the verticality of the building - a technique often used in the architecture of gothic cathedrals to give the impression of height. Today it may seem unusual to design a secular bank in a style suggestive of a religious building. However in the late nineteenth century, medieval architecture, and particularly the architecture of gothic cathedrals, was experiencing a widespread revival. For many architects, the style's appeal had more to do with its beautiful aesthetics than any religious motive. And one can envisage how the romanticism of the gothic style would have been an attractive outlet in an era of industrialisation and increasing austerity in design. Today on the ground floor, the majestic banking chamber is still resplendent with iron columns, gilded capitals and beautifully painted ceilings. I wasn’t allowed to take photos inside but the ground floor is accessible to the public as it is a fully-functioning branch of the ANZ bank. If you are in the area, it is definitely worth having a look around this magical room. Meanwhile, the top two floors of the building are permanently closed off. These levels were originally the residence of the bank's general manager, Sir George Verdon. In addition to holding this highly respected position, Verdon was also an enlightened patron, responsible for commissioning the design of the ES&A Gothic Bank. It is a shame the former residence is not open to the public as a museum as it is virtually intact and the last remaining one of its kind in the city. It would provide far better insights into the history of the bank than the current tacky and tired-looking 'ANZ Banking Museum' in the basement (hardly worth a look). 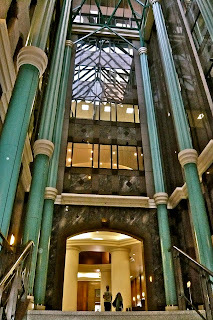 The Cathedral Room (below) in the former Stock Exchange building is one of my very favourite spaces in Melbourne. 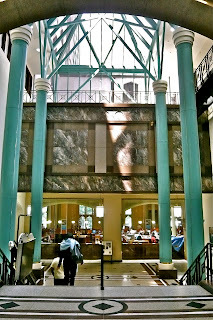 Originally the main trading room of the Stock Exchange, it was once the most important business centre in Australia. With six columns of Harcourt granite from Bendigo, carved capitals in white freestone and beautiful stained glass windows, it is clear to see how the room attracted its ecclesiastical name. 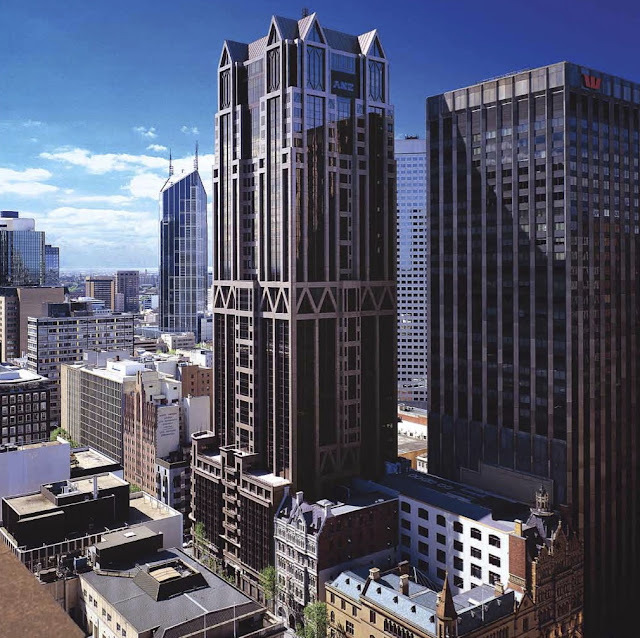 In 1990, the Gothic Bank was extensively restored by Lovell Chen Architects and Heritage Consultants and now forms part of the ANZ World Headquarters. Permission to build the ANZ skyscraper behind the Gothic Bank was granted on the condition that the heritage buildings be restored. 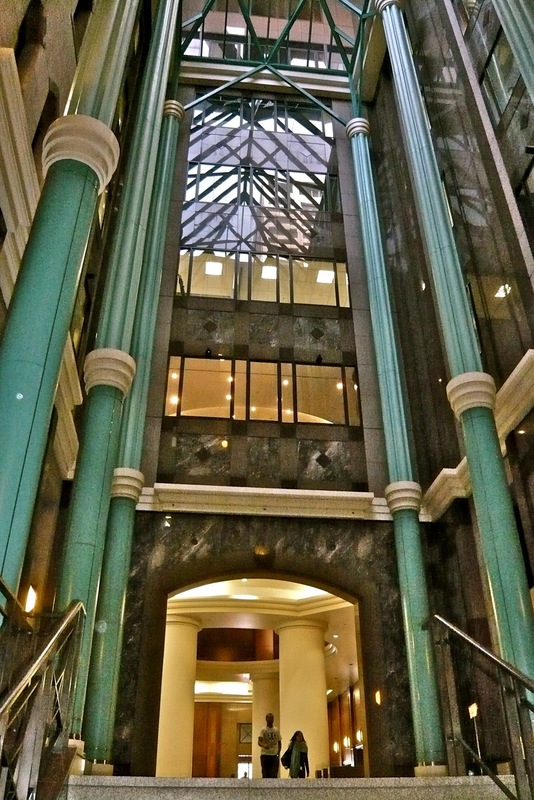 The ANZ skyscraper is linked to the Gothic Bank via a series of glass atriums and colourful, internal chambers. ANZ enjoys the entire complex, including the heritage buildings, as a very unique premises for its world headquarters. The ANZ Skyscraper was designed by Peddle Thorp Architects to reflect the Gothic themes of the heritage buildings below. The curtain-walling and zig zag tracery give the impression of gothic-like arched structural supports. Ideally, skyscrapers and other modern buildings would never have been erected in the city centre. They dwarf the surrounding heritage buildings, diminishing the monumental effect these old buildings were designed to have. They also ruin the charming experience that can be had while walking around a city that evokes a sense of history and eternal time. This does not mean Melbourne should not progress and enjoy much-needed vertical office and residential space - just that the modern buildings could have been built in a designated area away from the majority of heritage buildings. Unfortunately that did not happen. With the reality of the situation in mind, I feel that the ANZ skyscraper is a relatively positive building in Melbourne. It does not overwhelm the smaller heritage buildings as much as it could have. This is the intended result of the skyscraper being set back on a podium, so as to be sympathetic to the scale of the surrounding heritage buildings. Credit should also be paid to the first class integration with, and restoration of, the heritage buildings. 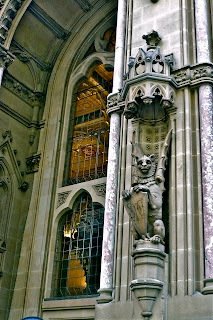 The ANZ Gothic Bank - a solid example of the new complimenting the old in Melbourne. I totally agree that "for many architects, the neo-gothic style's appeal had more to do with its beautiful aesthetics than any religious motive. And one can envisage how the romanticism of the gothic style would have been an attractive outlet in an era of industrialisation.." After all, the exteriors are fantastic and the interiors are even better. But I do think there was at least a quasi-religious impulse. After the vagaries of the gold rush and the shonky land deals, banks needed to appear solid, serious and totally reliable with peoples' savings. God like, really. 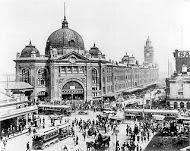 Melbourne was once internationally acclaimed for its magnificent architecture and boundless possibilities. Regrettably, many of the most impressive buildings from this period were demolished in the 1950s - 70s, due to a short-sighted view of progress. While many beautiful heritage buildings in Melbourne have survived, they are still at risk of being demolished at any time. Melbourne Curious aims to spread awareness about the importance of preserving the culture and charm of our city by saving its heritage. 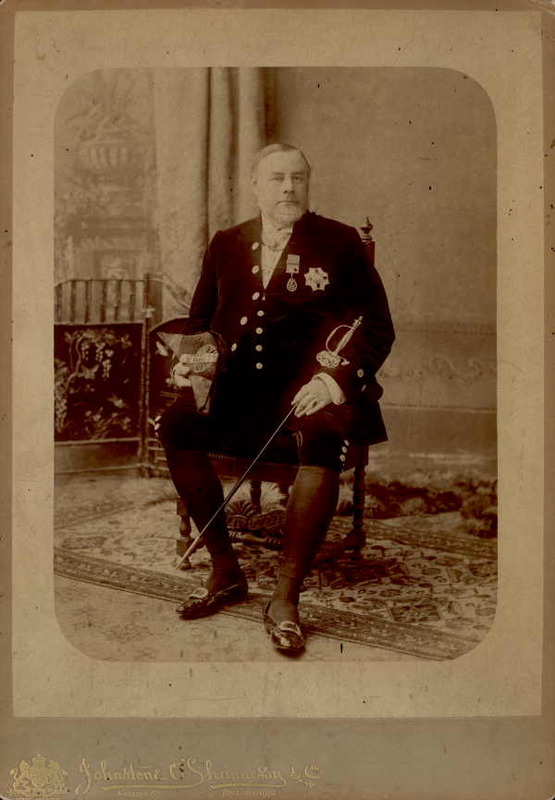 I also hope to share with you my passion for Melbourne's history and unique sense of style. Could Ted Baillieu be the saviour of Melbourne's heritage?